The Story of Owen is entertaining, unique, and Canadian to the core. The dragons may come flying out of fantasy but this book is very present and relevant in a real world setting, a small down with real and intelligent people trying to protect it, a group of characters that can't help but make you laugh and cry and listen intently to the tales of their heroism. Owen and Siobhan are both interesting in their own ways, Owen and his dragon slaying, his knowing that he will be a dragon slayer like his parents and his aunt before him, his acceptance and strength, and Siobhan with her understanding, her support, her attitude. It's a curious friendship they have, one that began because of proximity and continued through tutoring and her acceptance to become a bard. 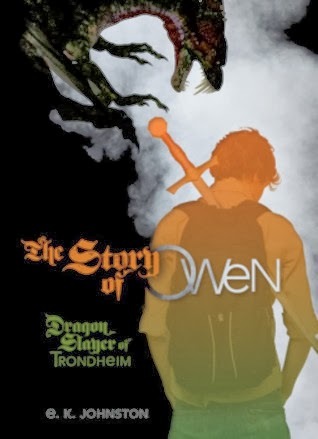 To tell the tales of Owen and his dragon slaying. This story is told in such a compelling way, in a style befitting a bard. I couldn't turn away from this book, it was almost as if I could hear Siobhan recounting the tales of Owen and his father and aunt as she saw them, calling out to the good people of the town and sharing tales of bravery and fortitude. Or about how he was failing algebra and she was brought in to tutor him. Siobhan also provides historical backstories on the dragons, the men and woman that slay them, and the countries that try to protect their people and carbon emissions. Because of the dragons, history as we know it has been altered, tweaked and played with. Dragons are seamlessly woven into our world until it becomes Siobhan and Owen's world. A world where dragons set barns and houses alight so they can feed off of the charred remains. A world where dragon slayers are recruited to do battle for their country, to face off against sharp teeth and burning flames. While I knew this would take place in a small town, I didn't expect to get so involved in Trondheim and the politics of dragon slaying in a small town. It lead to the comparison of small towns and large cities, how both are important but the towns are often overlooked because of the needs of the cities. But it doesn't mean those small towns aren't important. This book is so Canadian when it comes to humour and character, a little easy-going but practical and thoughtful. Almost every Canadian or Southern Ontario reference made me laugh, including the mental image of a dragon flying straight into Toronto during a hockey game. It's certainly an intriguing look at what it's like in a small Canadian town when everyone comes together to protect it, protect their homes. It's so Canadian, with the small-town hero and the people around him, and the one to tell his story (while being involved herself). I want more of this town, more of these characters, and more from this author. What an adventure. I'm Lindsay. I've got an English lit degree, and I spend my days reading YA lit, writing it, or reviewing it. Also reading webcomics and watching anime. New reviews are posted Tuesdays and Fridays (unless I'm busy or there's a holiday situation). Review: Uprooted by Naomi Novik.